This definitive biography of Moshe Feldenkrais retraces his remarkable adventures and explorations over several continents, and through some of the pivotal events of the twentieth century. Weaving together Feldenkrais's life and his work, this book is compelling reading for all who would like to learn more about his thought and method, and indispensable for anyone already deeply engaged with his work. Authored by Mark Reese, Feldenkrais's long time student and an accomplished Feldenkrais practitioner, this meticulously researched book took nearly two decades to complete. This is a collector quality first edition. *The publisher has authorized us to provide a 10% discount when you order a Case of eight books. In most cases this also results in a significant reduction in the per book shipping cost, especially for International orders. 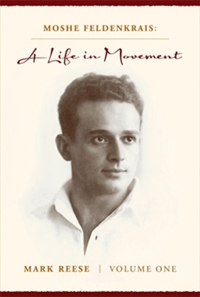 The odyssey that is Moshe Feldenkrais’s life began in Eastern Europe, in what is now Ukraine. He came of age amid many of the central crises of the 20th century, experiencing firsthand the turmoil of the World War I as a child. He emigrated alone, at 14, and became part of the establishment of a Jewish Palestine. Later, Moshe would work with the Curies in groundbreaking nuclear research and find a mentor in Jigoro Kano, the creator of Judo, who deputized him to introduce this martial art to France. Moshe’s intellect was formidable, and his explorations led him to become a pivotal figure in the science of somatics. A synthesis of Feldenkrais’s life and his work, this biography will be compelling reading for those who would like to learn about his thought processes and about the Feldenkrais Method, and indispensable for anyone deeply engaged with this work. Bring the book to your workshops or classes. Talk about it. Leave a copy visible in your office or waiting room so you can start conversations about Moshe and the excitement about the bio. Regardless of whether a client or student might want to own or read the bio themselves, Moshe is an impressive figure and his story helps illuminate the Method in a myriad of ways. Show some of the pictures in your classes, or tell some stories from the book. The book is full of details connecting Moshe's life to his work. There is lots of potential for story telling. Post on Facebook about it, blog, twitter etc. etc. Again build the buzz. Review the book on the Feldenkrais® Resources website. As of this writing, no one has yet reviewed it. Review or write about the book in a local publication. Announce the book on your home page, (we can support you with the artwork). Whether people want to buy it or not, it casts a glow. (Consider setting up an affiliate account so people can click through your home page to purchase the book. You get a percentage of all sales that come through your site). Ask your public library to carry the book, ask your students to request it. Download a copy of the beautiful book poster designed by Kaethe Zemach-Bersin. Print it and hang it somewhere it will be seen. Again it can serve to start a conversation. (You can download a PDF for no charge by clicking HERE. It can be printed at any high quality copy store. Part of the responses we've been getting include questions about the book and its future. I've included answers to some of these at the bottom of this mail. And yes, there is a plan for volume 2! Q. Will the book come out as an e-book? A. Yes, sometime, possibly later next year. We have begun to research the details. Q. Why is the book not being sold by Amazon, Barnes and Noble or other large booksellers? A. This book was a labour of love, over many years. It demanded an incredible amount of work including extensive research, editing and at the end, production and design costs. This has created debt and until this is paid off the majority of the proceeds from the book are going for debt remediation. Thus Feldenkrais Resources is returning the majority of the proceeds to ReeseKress Somatics Press for the time being. These large corporate booksellers also take large cuts! Once a substantial part of the debt is paid off the book will be distributed more widely. Q. Will there be a Volume 2? A. It is very much Carol Kress's intention to finish Volume 2 as well. Resources will need to be accumulated for this to move along. Q. Why is the book important for Feldenkrais Practitioners and Students? A. If you want to fully understand the genesis of the Feldenkrais Method® and the essential ideas that are the foundation of the Method, this is the book to read. This should be the "go to" book for every Feldenkrais Practitioner who wants to be able to speak eloquently about the Feldenkrais Method. There is no privilege in being the first to review this book; the greater value is in saying (I hope) something intelligent. I must further confess that I have not yet read the entire opus. I took the advice of Carol Kress Reese who states in her preface that â€œpractitioners .. and readerx... will find their own pathway (italics mine) to the treasure it holds.â€ I first covered the account of Feldenkrais and the Gurdjieff work, the comparison with Wilhelm Reich and the tangled (is there a better word?) relationship between the Feldenkrais and F. M. Alexander schools. Rees’s comparison of various schools and their degrees of influence on Feldenkrais are thorough and fair. In no way does Reese become a mouthpiece for an ideology (the McThink of thinking) turning Feldenkrais into a father figure to be worshiped, an unfortunate feature of Ernest Jones’s early biography of Freud. The worst fate of a creative iconoclast is to become an idol.